Now you can learn the nations of the world, the states of the USA, and more, with the aid of a proven quick-learning interface. In a few short sessions, you will master the maps and forge a clear mental picture of the political geography that shapes our civilization. With World Geography Tutor%u2019s interactive map technology, you can learn the nations of the world, plus the states and state capitals of the USA, and much more, far more easily than you would have dreamed possible. Thousands of people all over the world have used our geography software with great success. 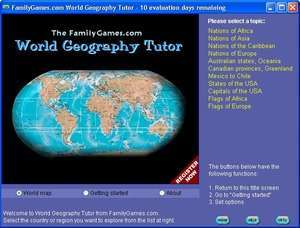 World Geography Tutor 1.9 is a shareware program and can be used as a demo to try the software until the free trial period has ended. A full version of the program is available after the trial period ends. For security reasons, you should also check out the World Geography Tutor download at LO4D.com which includes virus and malware tests. Additional screenshots of this application download may be available, too.